While weeding and turning the soil in my sister-in-law, Rachel's, future vegetable garden today, we came upon this tiny guy hiding in a clump of old, wet maple leaves: a black and yellow salamander. He was an itty bitty creature. I'm glad my little nieces were around to meet him, as salamanders, like most amphibians, are becoming endangered. 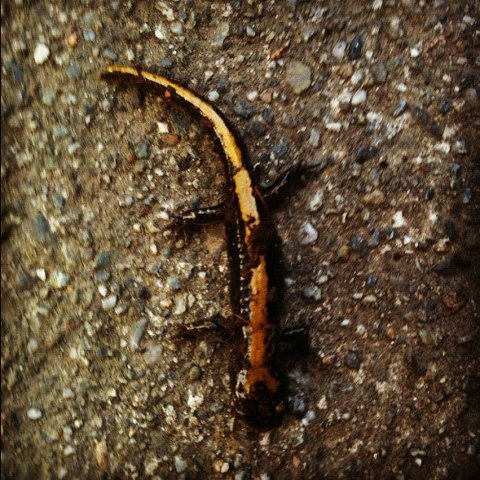 I haven't seen a salamander in years (since the days I used to play around in the muck in the woods, crawling around rotting logs and such as a kid). I'd have to say that this was probably one of the highlights of my day (other than having my other sister-in-law, Caraline, come visit me at work). I told Rachel we should name her "farm" Salamander Parcel.